Shotokan is one of the four main schools of Karate in Japan. It is best characterised by its long and deep stances and its use of linear movements. This style of Karate has little of the circular movements found in Okinawan styles of karate, nor does it have the body conditioning and supplementary training exercises typical for Okinawan Goju Ryu Karate. It is considered by many a sports style of Karate, where tournaments and point-sparring are central to the art. Kata is often described as a set sequence of karate moves organized into a pre-arranged fight against imaginary opponents. The kata consists of kicks, punches, sweeps, strikes, blocks, and throws. Body movement in various kata includes stepping, twisting, turning, dropping to the ground, and jumping. 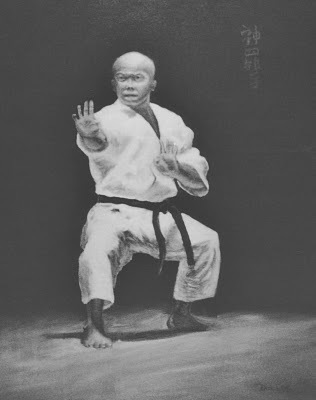 In Shotokan, kata is not a performance or a demonstration, but is for individual karateka to practice full techniques—with every technique potentially a killing blow (ikken hisatsu)—while paying particular attention to form and timing (rhythm). As the karateka grows older, more emphasis is placed on the health benefits of practicing kata, promoting fitness while keeping the body soft, supple, and agile.